Raise for the Roses! - The Junior League of Boston, Inc. 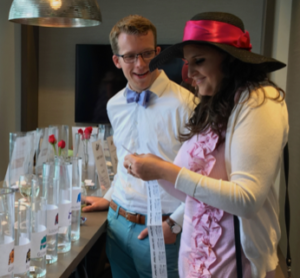 The Raise for the Roses event was the perfect mix of Derby fun, spring fashion and philanthropy. 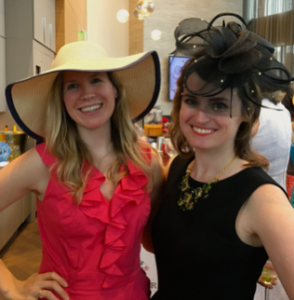 The Derby event raised funds for the Junior League’s mission of supporting the greater Boston community through community programs. The weather cleared up just in time for the race and to take in stunning views from the Skyline Suite at 30 Dalton. Attendees got into the spirit with raffle tickets to bet on their top contenders and a chance to win a range of amazing prizes. It was a great opportunity to socialize, scope out the best hats and support the League. Already planning your hat for next year’s race? Take some ideas from some of our attendees, including our winners for ‘Most Dapper’ and ‘Best Hat Award’ (bottom center photo). Horses on top of hat? We hadn’t seen that before! The Junior League’s first ever Derby event was made even more memorable with the exciting win by Always Dreaming, which marks the fifth straight year that a favorite has won the Derby. Definitely one for the books!